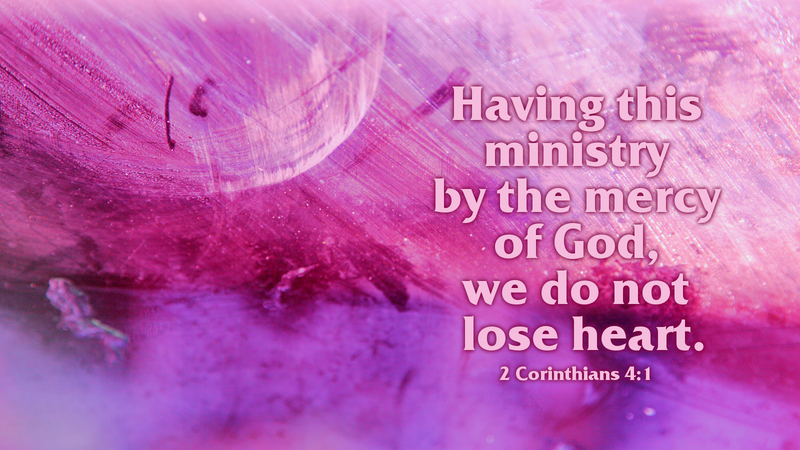 “Therefore, having this ministry by the mercy of God, we do not lose heart. We have renounced disgraceful, underhanded ways, we refuse to practice cunning or to tamper with God’s Word, but by the open statement of the truth, we commend ourselves to every man’s conscience in the sight of God” (2 Corinthians 4:1–2). Ministry in Jesus’ name is not always easy. Not for pastors and not for lay people. We try diligently to reach out to those who have not received the Gospel and sometimes we are turned away. It would be tempting to lose heart—or to try to adapt or adjust God’s Word so that it is more palatable, comfortable and acceptable to those who are all too worldly. St. Paul faced these temptations, as well, especially with regard to his ongoing struggle with the hard-headed, strong-willed Corinthians! We have two of Paul’s letters to the church in Corinth, but many scholars believe there was a series of letters called “The Corinthian Correspondence”—some of which have been lost to us. In the midst of his wrestling with the Corinthians, Paul affirms that he will not lose heart, nor will he resort to disgraceful, underhanded ways, nor will he practice cunning or tamper with God’s Word. Rather, Paul will only present an open statement of the truth—and each one can deal with his own conscience in the sight of God. And isn’t that the best we can do? Isn’t that the only mature and responsible Christian approach to those who are difficult or unwilling? Because we have this ministry by the mercy of God, we must make use only of godly methods. We must not use disgraceful or underhanded strategies; we must refuse to practice cunning, or to tamper with God’s Word in any way. Let us offer an open statement of the truth, as presented in Holy Scripture, and let each person’s conscience guide them, in the eyes of God. Prayer: Lord our God, let us not lose heart as we struggle with unbelievers, and those who challenge the truth of the Gospel; through Jesus Christ our Lord. Amen.